JACKSON HEIGHTS — A street corner steps from I.S. 145 has been renamed for the school's longtime principal, who locals said went above and beyond her role to inspire thousands of students. Dr. Dolores Beckham was the principal of the school since 1999, after decades working in the Department of Education. She died last year of cancer at 62. 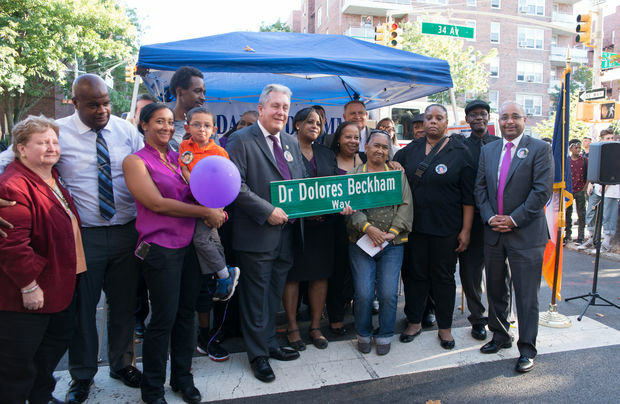 Now the corner of 80th Street and 34th Avenue will be known as "Dr. Dolores Beckham Way," a tribute to a woman who preached global understanding and tolerance at her diverse school. "The students of this school really loved Dr. Beckham," Councilman Danny Dromm, who sponsored the street renaming and organized the ceremony, said. "Today is more about a celebration of Dolores' life." Guests at the ceremony wore purple, Beckham's favorite color. Many wore pins with a photo of her sitting at her desk in her principal's office. And the ceremony was held on what would have been her 63rd birthday — so before revealing her new street, hundreds sang "Happy Birthday" to her. People from throughout her life came up to speak, remembering Beckham, who was a champion of the school's dual-language program, which is considered a model for the rest of the city. She traveled around the world, meeting educators in different countries and bringing back what she learned to Queens, where she lived and taught. She taught in Queens and The Bronx, and was awarded a Fulbright in 2008 and received multiple degrees all focused on education. On the morning her students took the state test, she wore the school uniform and held pom poms at the school's corner, cheering her kids on. "They name streets after heroes," Mark Cannizaro, the president of the principal's union, CSA, said. "Dr. Beckham was a hero." She taught and worked with thousands of students, but her first pupils were her four younger sisters. After coming home from kindergarten, Beckham would line her four younger sisters up and teach them what she had just learned, sister Angela Beckham recalled. "With chalk in hand and everything else, and making sure that she drilled us, so that we were ready," she said. The memory of that came rushing back as she walked to the school for her sister's ceremony, she said. And "playing school" worked for the Beckham family, where many sisters, nieces and nephews became educators, she said. Beckham was concerned about her kids and their families even in her last days battling cancer, her family said. "We really with our heart we wanted to say thank you so much for all of the love, the support, the outpouring words and tributes at this beautiful ceremony," her sister said. "Her purpose in life was pure and simple: serving others, opening her heart and resources to those in need, and helping to make a difference in this beautiful world." Police Release Photo of 'Person of Interest' in Fatal Shooting on 95th St.